Estrogen replacement therapy and progesterone therapy are both available to women at all three of our clinics. Many women find that estrogen replacement therapy, when combined with progesterone (and, in many cases, testosterone) can reduce or eliminate a variety of symptoms associated with various illnesses. The most common reason that women come to our clinic seeking estrogen replacement therapy is that they are suffering from the symptoms of menopause or perimenopause. However, symptoms of estrogen, progesterone, and testosterone deficiency can begin to occur much earlier than the average menopausal age. 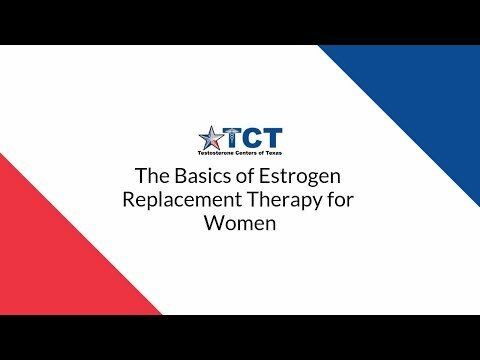 When we recommend estrogen replacement therapy, progesterone therapy, or testosterone therapy to our female patients, we don’t focus solely on reaching predefined levels of hormones. Instead, we work to bring those levels back into balance. We also target improvement of symptoms as a goal of therapy. Every person has different levels of hormones in their body, just as every person has a different fingerprint. We test your levels and then titrate until we find a dose and combination that works for you. In fact, this is one of the top recommendations from the British Menopause Society when it comes to estrogen replacement therapy. While in some case this will include simply estrogen replacement therapy, we have found that many of our patients are suffering from low levels of testosterone and progesterone as well. Usually, women need a combination of hormones to achieve a balance that makes them feel healthier, and estrogen isn’t always the culprit. In fact, some women may find that one hormone dominates the other (estrogen levels are above normal or high-normal, for example, but progesterone levels are low). In these cases, therapy can still be indicated because the hormones taken as a whole are out of balance. The same type of thinking should be applied to levels of testosterone in women, even though testosterone levels in women are quite low compared to men. The causes of low testosterone in women are varied, and, as you might expect, are very different from the causes of low testosterone in men. Click here to learn more about the symptoms of low testosterone for women. If you find yourself struggling with these symptoms, click the button to set up a free consultation. When hormone therapy began to come of age in the 1980s, many medical care providers didn’t understand the importance of certain types of hormones being bioidentical (bioidentical meaning hormones that are chemically identical to the hormones found naturally in your body). Today, we know that female hormones like estrogen need to be bioidentical in order to be both safe and effective. All our estrogen replacement therapy uses bioidentical hormones. Also, for the same reasons of safety, we utilize topical therapy (a gel applied to the skin) for replacement of estrogen and progesterone. However, the same does not apply to testosterone. Testosterone replacement therapy does not need to utilize bioidentical hormones in order to be safe and effective. Estrogen replacement therapy and progesterone replacement therapy tend to work best when administered through bioidentical topical gels. While injections are what we recommend for testosterone, topical, daily estrogen, and progesterone offer a hormonal environment most similar to natural production. Oral and injectable forms of these medications are still options. However, clinically, we have seen the best response and compliance with topical gels. Studies show that BHRT with topical medication is also much safer than traditional hormone replacement has been. If you’re suffering from any of the symptoms we’ve listed above and you want to learn more about estrogen replacement therapy, click the button to set up a free consultation.